Start Low and Slow As mentioned, peeling is par of the course when using a topical retinoid. "Among its many functions in the skin, including reducing inflammation, decreasing the size and secretion from oil glands, [and] loosening clogged pores, topical retinoids serve as arguably one of the only topical treatments that normalize cell turnover in the skin. That is, it serves as a skin exfoliator when used regularly and correctly," says Dr. Pooja Sodha, a board-certified dermatologist and assistant professor of dermatology at Duke University. She's also the medical advisor for FaceMD+. "It takes several weeks to start seeing these results, but the peeling is an important part of the function of topical retinoids." One of the best ways to manage this peeling is to slowly introduce your skin to a retinoid. This means using a lower concentration formulation, and with consistent, but spread-out, application. Dr. Sodha says every other day is ideal, and that you can work up to more frequent application, then a stronger potency, about once every four weeks. 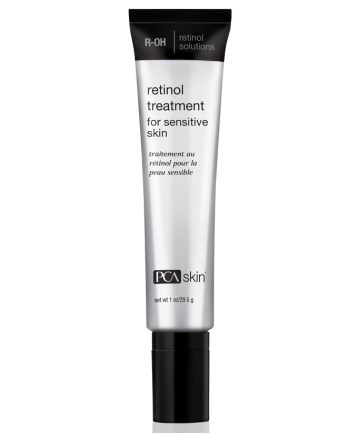 A great starter retinol is PCA Skin's Retinol Treatment for Sensitive Skin, $110.